Artie Van Why lived in New York for over twenty-five years and was working in his office’s building across from the World Trade Centre when the first plane struck the towers on September 11th, 2001. That Day In September is his account of the tragedy and of the way the residents of New York coped with the event, the immediate aftermath and the long process of rebuilding lives. It’s hard to believe that today marks the tenth anniversary of September 11th. The horrors of the tragedy still seem so fresh in people’s minds. The world has changed greatly due to the events of that day, with the repercussions stretching far beyond New York’s city limits. For those who were there, however, those who experienced the scenes of terror and destruction at first hand, the changes and consequences were much more personal in nature. Artie Van Why was one such witness and That Day In September is an honest, powerful work relating his experiences on that fatal date. The book opens with the personal path that led him to New York, allowing the reader to learn a little about the man behind the account. Then, the tragedy itself is described. Van Why manages to sketch the horror of the events he witnessed without the scenes he depicts ever feeling gratuitous. As an author, he is very respectful of those who died, of those who lost loved ones and of the many people who reached out to offer help and comfort to those who needed it. 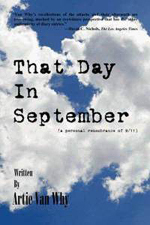 That Day In September also deals with the aftermath of the tragedy – both in a personal sense and in a broader one. It speaks of the way the citizens of New York supported each other through the subsequent days and weeks and of Van Why’s own struggle to come to terms with the event. Throughout, however, there is an emphasis on the good that can be found in humanity, something that cannot be underestimated in a book dealing with such a collection of evil and incomprehensible deeds. The language of That Day In September is not particularly elegant, and the grammar in the book could have been more refined. However, while this often detracts from my enjoyment of a book, in this case I found that the opposite was true. Van Why’s writing style gives a real immediacy to his account. It somehow feels more raw, more emotional, to read about the events of that day in language that is not made impersonal through too much attention to form and style. I was on the brink of tears for much of the time it took me to read this – a sign that any flaws in the writing do little to diminish the power of the piece. That Day In September was not an easy book to read, but I am very glad I did so nonetheless. As an Australian, I have only been affected by September 11th in a peripheral fashion, and it was good to be able to read a personal and first-hand account of the events I witnessed on television. Horrific events of this scale can all too easily become about numbers rather than individuals. But Van Why’s story is just one of so many – and I thank him for sharing it. 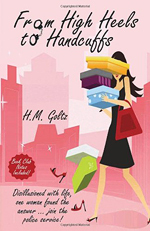 The blurb of From High Heels to Handcuffs concentrates on the author’s decision to leave a career in marketing in order to enter the police service, but the book itself covers a much wider sphere. It’s an autobiographical work covering much of Goltz’s adult life, with her time at the police academy constituting perhaps a third of the book. The big appeal of this book is the author’s voice. Chatty and personable, the text reads a lot like you’re sitting down with her and hearing her stories over coffee. It’s this that makes her revelations about her failed marriage personal (rather than accusative) and allows the reader to remain interested in her life, even when it’s one extremely far removed from the reader’s own life. Goltz is someone who has led a very interesting life (although perhaps lives would be the more appropriate word!) and that makes for an interesting memoir. I would have loved to have read more about her time at the police academy, but understand that it was only one part of the personal journey the book recounts. The one thing that detracted a little from the over all quality of the book were the occasional grammatical errors that could be found throughout the pages.